Another day in a house. It’s getting to feel comfortable and that makes me uncomfortable. So I went shopping and bought a backpacking stove, a small camera case suitable for packing. and some lightweight food items. During the shopping trip I noticed that I would forget to lock the car about one out of three times and twice I came back to the car and found my lumbar support lying next to the door. I am a bozo. I am confused. I am nevertheless somehow usually unscathed. Again and again I bumble and put myself at risk and survive. Fine then. I don’t get to be proud of it really because I look a fool but, in fact, I wouldn’t have it any other way. When I got back to the house I made a simulacrum of my famous shitake vegetable stir fry. Since I didn’t have my rice cooker I looked on the web to find how to make rice and learned a new way that made great fluffy rice. Actually, better than my rice cooker. Peg and I took a walk through the town of Greer SC and then a ride to look at another house she is considering for her next home. Life unfolds. I took no photos today but I got around to processing one of the endangered swallow tail kite that I took on April 23 on the river trip. I saw them several times—a group of three. 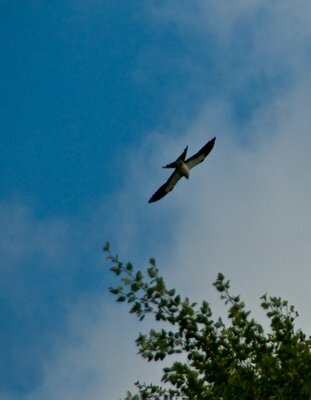 For a raptor kites are quite social, often nesting in villages. They are threatened by the loss of the lowland forest habitat which I have been so enjoying the last weeks. Loving the blog, Pattison... Love to you. The semester is almost over. Thanks for the calls, messages and good wishes... life should calm down a bit here in a couple of weeks! Life should calm down and will when you make it do so. Do take care of your fine self. Love back.